Shadows of the Emerald City: Shadows of the Emerald City is Out Now! Shadows of the Emerald City is Out Now! Shadows of the Emerald City (Northern Frights Publishing) is out now! "No other story has touched as many hearts and endeared itself into the American fabric as The Wonderful Wizard of Oz by L. Frank Baum. Often toted as America's First Fairy Tale, this heartwarming classic has been made and remade again and again across every medium known to man. The themes are timeless, the characters themselves beloved. But like all fairy tales, The Wonderful Wizard of Oz has one foot planted in the fantastic, and the other foot planted in blood. Explore the darker side of Oz...the parts too terrifying or obscene to be told as bedtime stories. Here are 19 tales by some of today's hottest Indie writers peeling back the emerald layers of the land of Oz and revealing the pink, bloody flesh beneath. Some of the people and places you may recognize from your childhood, but you won't believe what happens to them. Shadows DO fall in the Emerald City, and where they are their darkest is where you will find the true terror of Oz. This is, first and foremost, an anthology of horror stories. And readers looking for something different in a horror collection, a collection that achieves this not only through the unique background of Oz but through a variety of tales and story modes, will find a sinister pleasure in these excursions over the rainbow. 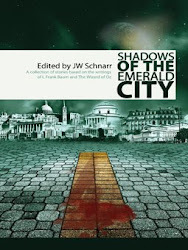 Shadows of the Emerald City, JW Schnarr’s 19-story anthology about the dark side of Oz, offers a sense of Oz’s continuing expansiveness as well as a satisfying number of characters that yearn to be part of the enchanted land. The bloodstained yellow brick road begins and ends somewhere close to the concrete of Calgary, Alberta! Definitely a solid collection that reminds you that there is a lot more than ooze and awe's in the Scary old land of Oz.